A few days ago, the good people at The Gahan House tweeted that they were expanding to Halifax. I'd like to put this out there for folks, to confirm that they are indeed taking over the place that was once the beloved Hart and Thistle. As far as I know at the moment, no brewing staff from PEI are slated to make the move. It sounds like most / all staff there will be new to the company. I wish them the best of luck there - I'm sure they'll make it a highly successful / quality destination, which should please the beer-loving folk who miss the old H&T. Great news! These guys really know how to make a quality beer with drinkability. Gahan will make a better go of it with much improved beer. "with much improved beer." If they can improve on Nash's beer that will be impressive. I miss the Hart & Thistle. A great location. Some of the best beer I have ever had anywhere. My few tourist dollars weren't enough to keep them going. Best wishes to the Gahan House. I promise I will be over to drink their beer. I hate to burst your bubble Frank, but the difference between a mediocre beer and a great one is not directly proportional to the amount of hops added. I don't think that's what Frank was saying directly, but we all know Nash uses a ton of hops. That being said, I have to echo what he's saying - improving on some of the great beers Greg made there is a tall order. All I know is that Nash made some awesome beer for the Hart & Thistle. Not all were IPAs.Russian Imperial Stouts, Smoked Porters, Stock Ales, but yes, the IPAs were my favorite. It was always the highlight of my trips to Halifax. 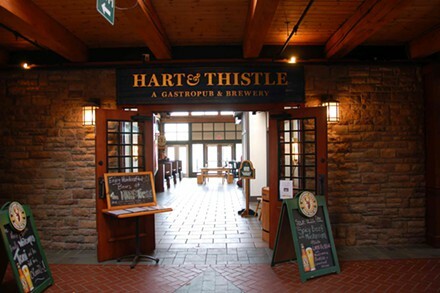 Most Hart & Thistle beers were one demensional hop bombs that smelled like sweaty socks and BO. Few were balanced and sessionable. I'm really looking forward to Gahan's creativity.